One thing I see quite a bit these days, is vehicles coming into the shop running badly, misfiring, check engine light code P0300 and getting very poor fuel economy. Usually upon a test drive, I’ll find it stumbling on acceleration. Back at the shop, while checking for trouble codes there will most times in fact be multiple codes for misfires. This is often due to problems with ignition system, particularly the spark plugs failing. What is happening is called ‘carbon tracking’. This is where there can be a small crack in the porcelain of the spark plug and it allows the spark to arc out and not make the full journey to the end of the electrode in the cylinder. Once this occurs, you will get a random P0300 and it only gets worse over time. Accelerating from a stop, or trying to pick up speed on the highway to make a pass are when the carbon tracking misfires will happen. The more and more it does, it will build up an actual track of carbon on the outside of the spark plug, hence the name ‘carbon tracking’. If left without fixing, it can damage the ignition wire as well. This has gotten so bad on some vehicles, that there has actually been factory recalls to check for this problem and replace the affected plugs and wires. As you can see in the picture below, I have three spark plugs, each with traces of carbon tracking. The one on the right is by far the worst and has been driven a very long time. 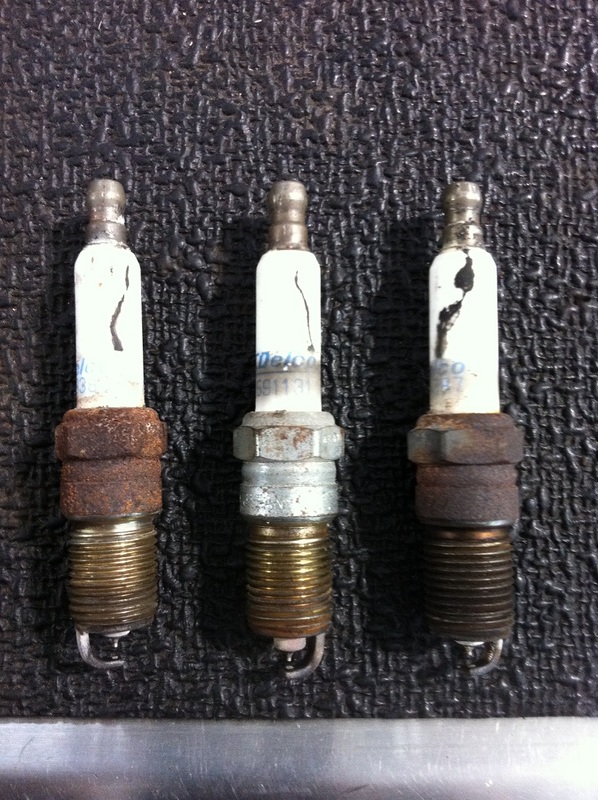 The spark plug in the middle has signs of this just starting, but it is still a problem. Finally, the spark plug on the left is about mid-way between just beginning and completely carbon tracked. Any of these stages would require spark plug replacement. I would usually recommend replacing the ignition wires as well, just to be on the safe side. This will always cure this type of P0300 misfire and stumble upon acceleration. If you are experiencing a problem like this, it would be a good idea to get the ignition system checked out for signs of carbon tracking. This is a common failure, and luckily not an extremely expensive repair! coil over sleeves- do i need after market struts?? 3 Comments on "Spark Plug Failure Causing SES Code P0300"
The spark problems have been created as a result of not understanding the physics of combustion, and the limitations of spark plugs. The automotive industry, and the EPA will not talk to me. Spark plugs, and engine design has hit the limit. I pulled a spark plug where you can hold the hex and seat and move the ceramic insulator with center electrode up and down, had a total failure of the ceramic insulator inside the seat causing it to blow the boot off of my Honda Accord. I am thinking the insulator failed on the compression stroke breaking the insulator from the hex and seat, on the intake stroke it sucked in the bits of ceramic around the center electrode and on the exhaust stroke sent the ceramic through the exhaust valve causing damage. Needless to say because of this spark plug failure the engine is no longer running and at minimum tear it down and inspect the head and valves. A compression test shows strong compression in all cylinders but the one with the plug failure. This is a very common problem on the GM 3.4 and 3.5 liter engines in the Chevy Equinox and Pontiac Torrent. I have been a mechanic for 15 years and cannot figure out why it is always the #1 cylinder that is misfiring. Most of the time it is that one, right behind the alternator, but a few times have had #5 cylinder misfire.